“Markets are conversations,” the Cluetrain Manifesto said in 1999. 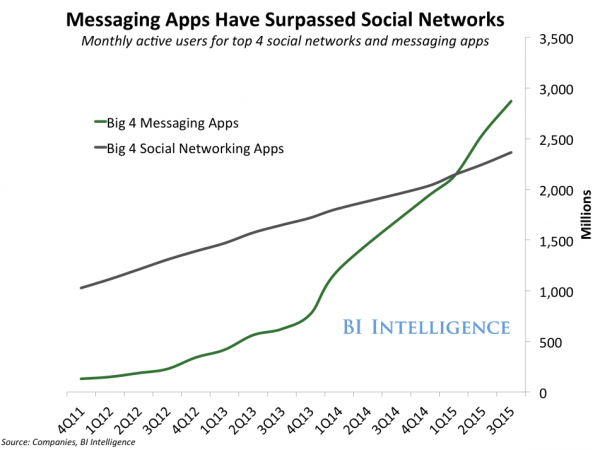 Today’s markets are more conversational than ever, especially as more and more companies create chatbots for messaging apps. Chatbots (details below) enable us as marketers to do something that we’ve only ever been able to dream of doing: personalize content delivery and have meaningful conversations with customers at scale. One misstep and the public at large may not forget. 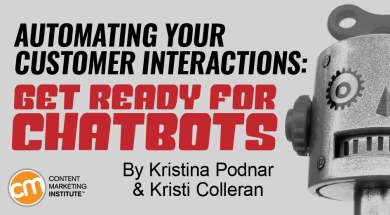 Read on to learn more about what these chatbots are, how they’re changing the conversation between companies and their customers, and the opportunities (and risks) they represent for marketers. Before we get to chatbots, let’s take a look at messaging in general. Far from the simple text-messaging programs of the 1990s (like AOL Instant Messenger and Yahoo! Messenger), today’s messaging apps are part of larger “commerce, customer support, and advertising ecosystems,” as described by Erik Devaney in this Drift article. In the last two years, while marketers have focused on establishing a presence on social networks (primarily Facebook, Twitter, Pinterest, and Instagram), the total number of active monthly users of messaging apps (primarily WhatsApp, Facebook Messenger, WeChat, and Kik) has surpassed those social networks. The exploding popularity of messaging creates an opportunity for companies to connect with their customers like never before in a way that is contextual, relevant, personal, and conversational. That’s where chatbots come in. The best way to understand what chatbots are is to see one in action. Let’s take a look at the chatbot that KLM Royal Dutch Airlines‎ recently introduced for Facebook Messenger. With the customer’s permission, the KLM chatbot automatically “texts” the itinerary, boarding passes, check-in confirmation, and delay notifications. It even connects the traveler with a human staff member if questions arise that the chatbot can’t answer. Since the chatbot lives on Facebook Messenger, customers don’t need to download and get familiar with a separate app as long as they have the Facebook app. Travel – KLM, Kayak, and Hyatt help people book trips, deliver their boarding passes, and provide concierge services. Health care – HealthTap and MD help people identify illnesses and find health care advice. Retail – H&M, Sephora, and Everlane customize the shopping experience. Fast food – Taco Bell and Pizza Hut help people order food for faster delivery. Grocery – Whole Foods helps people find recipes and suggests food products based on the listed ingredients. Government – The White House helps people contact government officials, including the U.S. president. Marketers in these organizations are using messaging and chatbots to bring value to their customers, not only through their products and services but also through the entire relationship. While organizations are experimenting with chatbots, they should avoid over-governing the process. When it’s time to use chatbots to engage customers, it’s time to govern the process in a more mature fashion. Data localization and governance – In what country does your organization store information gathered from customers via a chatbot? How does your organization structure chatbot and user data? Is that data secured so as to comply with relevant regulations such as the Health Insurance Portability and Accountability Act? How is that data stored and transferred across country and regional borders? Children’s online protection – Does your chatbot recognize users under the age of 13 and adjust or deny interactions to them based on legal requirements in the relevant countries? Because countries have different laws and regulations intended to protect their citizens, the country where your customers’ chatbot interactions originate further dictates which requirements you must follow. You must understand which issues apply to your use of chatbots and how to handle those issues so that you minimize risk and maximize achievement of your marketing objectives. For brand protection, legal compliance, and competitive advantage in this new arena, organizations need to analyze and prioritize risks. Risks are best addressed with policies adopted by the organization to inform decisions made by marketers regarding online content and technologies. Policies enable organizations to reach their long-term goals. In my (Kristina’s) experience as a digital-policy consultant, policies are most effective when published to a central place that is widely accessible. You might not think you need policies around chatbots. Neither did many of the early adopters. The failure to fully examine the risks associated with automated conversation resulted in corporate embarrassment. For example, the New England Patriots’ and Microsoft’s separate chatbots tweeted racial slurs. Other miscalculations amounted to providing strange or unhelpful answers, as was the case with Poncho, Facebook’s “weather cat” chatbot, which has been known to give bizarre answers to simple questions. For organizations already managing their digital assets in a mature manner, the introduction of chatbots may simply call for a meeting with the legal or compliance department to review and extend existing policies. What credible bot-development and maintenance resources might you reach out to? Chatbots are redefining the way companies interact with customers, with employees, and with things. They’re opening new opportunities for marketers to use automated content to connect, collaborate, learn, and innovate. Done well, chatbots can yield clear benefits: cost-effective customer service, faster response times, and easier business transactions. Chatbots also bring pitfalls: costly lawsuits, fines for violating laws or regulations, and damage to the brand. Is your company using or talking about using chatbots? Please share your experiences and advice in a comment.